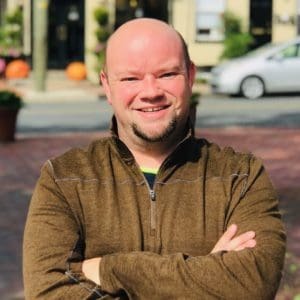 Mr. Holder has over 15 years of subsurface utility engineering and utility locating experience on various engineering and construction phase projects across a variety of market sectors including DOT / Highway, Pharmaceutical, Energy, and Commercial / Industrial properties. You may be wondering what the difference is between Subsurface Utility Engineering and Private Locating. 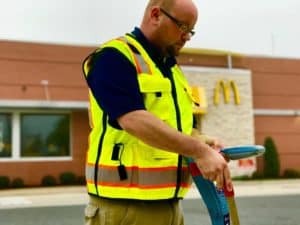 After all, both services include finding underground pipes and cables by connecting to them using electromagnetic locating equipment or ground penetrating radar. Both services will often mark the location of the utility with paint and flags as well. So why do so many firms use different terminology to distinguish between the two? The difference isn’t so much with the processes or procedures. It isn’t even so much about the difference in the data that is collected. The difference between Subsurface Utility Engineering and Private Locating is the intent of the data that is collected. What is the data being used for, and how should it be depicted to the client? The process of finding underground pipes and cables seems quite simple on paper. A conductive utility can be located by applying an electromagnetic frequency to the conductive material of the target utility. The magnetic field that is generated by that frequency can be detected using a receiver unit that is programmed to detect the selected frequency. For non-conductive utilities, a traceable (or conductive) material must be installed to locate the line with electromagnetic methods. 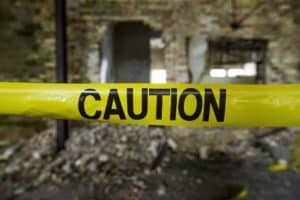 This can be in the form of aluminum warning tape (in some instances), tracer wire, or temporary methods such as a metallic fish tape or duct rodder. If there is no way to locate the line with electromagnetic equipment, then Ground Penetrating Radar may be a good resource. For both subsurface utility engineering and private utility locating, the art of designating the line on the ground does not change. Both services will find the same utilities in the same amount of time with the same effort applied. The difference is in the deliverable. Companies will typically use “private utility locating” when marks or paint on the ground is more important than locations on a map. This is especially true for active construction or environmental sites and projects. When there is any kind of excavation or ground penetration, marks on the ground for field personnel to see and avoid is the primary deliverable. Often, a field sketch and site photographs may also be included. Subsurface Utility Engineering typically includes more on the data side than the field marking side of the equation. Most S.U.E. firms will provide services in accordance with Construction Institutes / American Society of Civil Engineers code 38-02: The depiction of Subsurface Utilities. This code specifies how underground utilities should be depicted on professional and engineer drawings, and what quality level those utilities are. Designating utilities with electromagnetic and ground penetrating radar methods is known as Quality Level B data. Quality Level A data includes physically exposing the utility to obtain the precise vertical elevation as well as the precise horizontal location of the target. When a DOT, engineering, or design firm hire a company for Subsurface Utility Engineering, they are typically more concerned with depicting how the data will look on a professional drawing. Standard deliverables for SUE include electronic (CAD / MicroStation) files containing the coordinates of the utilities as surveyed by a professional in the field. Yes, Subsurface Utility Engineering will typically cost more than private utility locating services because of the amount of preparation prior to field crews visiting the project site, as well as the extra effort put into providing the deliverable. Utility records research is often performed for many Subsurface Utility Engineering projects. This is the act of contacting all of the utility companies if the vicinity of the project and procuring any available utility records they have. This is done so that S.U.E. firms can depict utilities on drawings as Quality Level D (often delineated as DATR or DATUR) when Quality Level B or Quality Level A data could not be obtained. DATR is an acronym that means “Depicted According To Record,” whereas DATUR typically means “Depicted According To Utility Records.” Any available utility records that have been procured by the S.U.E. firm are commonly included as part of the standard deliverable to the client. Additional site services that are performed during a Subsurface Utility Engineering investigation include land surveying. Professional surveyors will use the project’s established control points / benchmarks to obtain the precise coordinates of the utilities horizontal locations. Depending on the complexity and the number of underground utilities present, the surveyor may take a shot on a utility every few feet, up to every fifty feet. The shot data is then imported into the drawing program of choice (typically AutoCAD or MicroStation) and processed. Additionally, a topographic survey may or may not be included depending on the client’s needs. 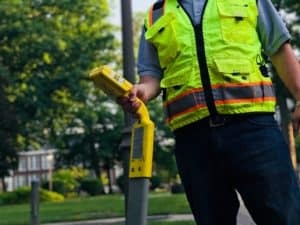 Private utility locating services are often less expensive because many of the extra costs associated with providing engineer quality drawings are not necessary if you only need a utility mark-out for your field personnel. What are these little colored flags in my yard? What is an Unlocatable Utility?